The XML Schema Toolbox provides model elements that you can use to model W3C XSD schema files. This Toolbox implements the constructs provided by the UML Profile for XML Schema. Having created your model, you can automatically generate the W3C XSD schema files from it. A Schema corresponds to a UML Package, which contains the type and element definitions for a particular targetNamespace. 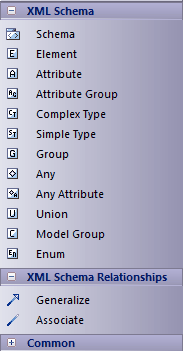 Drag this item onto an open diagram to create the Package to contain your schema model elements. The Package is stereotyped as XSDschema. Open the logical diagram created under the XSDschema Package and add additional schema elements to define the model.